Surgical site infections (SSIs) are a common surgical complication that affects between 2% and 5% of the 30 to 40 million operations that occur in the United States per year. SSIs are the most common nosocomial infection among surgical patients and are consistently the second most common healthcare-associated infection overall. Mortality rates after SSI are markedly higher when compared with patients without an SSI, as are the patient’s length of stay (mean, 7 days), hospital readmission rates, and direct patient costs ($500 to $3000 per infection). 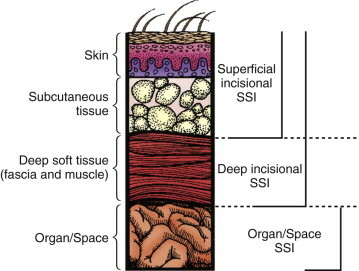 Development of an SSI requires microorganism contamination at the surgical site. During an operative procedure in which skin is incised, endogenous skin flora, the most common source of pathogens, are introduced into the exposed tissue. Additional sources of bacteria include patient colonization, mucous membrane or hollow viscous pathogens encountered during the operation, surgical personnel, operative instruments, and the operating room environment. An accepted surrogate for bacterial contamination at the surgical site is the wound classification. The risk of SSI increases with the degree of contamination and higher wound classifications. Wounds are classically defined as clean, clean-contaminated, contaminated, or dirty/infected. The NHSN developed a risk index by which the risk of an SSI can be predicted based on three major criteria: wound classification, American Society of Anesthesiologists (ASA) score, and duration of the operation. The SSI risk category is based on the number of factors present at the time of operation, including a wound class of 3 (contaminated) or 4 (dirty), an ASA class of 3 or greater, and an operation lasting longer than the 75th percentile of the duration of the specific operation. Each independent factor is given a single point if present, which determines the NHSN risk index category (0 to 3).